Enter the 2016 Quantitative Local Search Ranking Factors study. This mammoth, data-crunching undertaking to analyze 100+ factors across 30,000 businesses was conducted by Local SEO Guide and Places Scout, all toward the goal of figuring out how local businesses can rank better in Google. At Bruce Clay, Inc., we count lawyers and plastic surgeons among our SEO services clients, along with multi-location automotive service chains and national franchise brands. There are unique challenges posed by local SEO. So it was an intellectual joy to talk about the biggest-bang-for-your-buck local search strategies with two of the study co-authors. Many thanks to Dan Leibson (Local SEO Guide VP of local and product) and Mark Kabana (Places Scout CEO and founder). If you have 25 minutes (and some patience to stomach technical audio difficulties), I’d invite you to watch our discussion. Otherwise, I’ve summed up the highlights below. Read on for the top three things (and one crucial bonus) you need your teams doing today to get the edge in local search. Here’s a chart of the factors analyzed in the study. 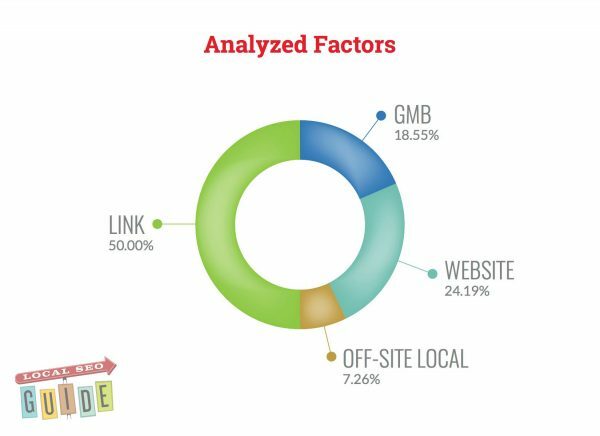 Dan Leibson: That pie chart represents the factors we analyzed and what percent were link factors, website factors, Google My Business (GMB) factors and off-site factors. Those are the core factors that we analyzed in the study. Mark Kabana: With the data we gathered, 50% of those factors were link factors. The reason we weighed links so heavily is because we’ve always known that links are important. The reason to do a study like this is because, in addition to links, we now have new things like reviews and social, website analysis and other things that are included as part of the study. The bottom line: Whatever you’re doing right now, stop doing it and try to get a few links. Top local #SEO tip from @DanLeibson: Stop whatever you’re doing right now and get a few links. Meetup.com allows sponsorship of local meetup groups. Find local meetup groups and offer to sponsor them with pizza or a room to have their meetup group. You can often get a link through that. The #1 most correlated local ranking factor is reviews. Mark Kabana: All along, Google has been focused on websites’ popularity. Whoever the coolest kid is in high school, they want to rank them the highest in Google. Back in the day, Google didn’t have a whole lot to work with so it was mainly things like backlinks that would get them to rank you higher. These days with social being a bigger influence, there’s a lot of different ways to become more popular in the eyes of Google; one of them is more reviews. Your business seems more popular if a lot of people are talking about you. Reviews may not technically be a backlink, but they may drive other factors such as click-through rates, people spend more time on your site, your bounce rate lowering, things like that might be a secondary factor that increases other primary ranking factors. Don’t be ashamed to ask for reviews. This is more applicable to small businesses. If you’re a multi-location business, you need to get buy-in for a review program at the corporate level. It’s really hard to get your locations all invested in that at the same time and it’s something you want to control with the marketing team. Look into GetFiveStars or Grade.us, or any type of review management software. Just below reviews, profile views and a handful of link signals, photos are a top correlated local ranking factor. Mark Kabana: The more photos you have, the more people are talking about you and you look cooler to Google. One thing we didn’t analyze is whether those photos came from the business or from a user. We measured the raw photo count from the Google My Business page. The question of whether photos that users share have more impact on rankings than photos that the business shares is something we’re going to look into in our 2017 study. Dan Leibson: Google wants to focus more on brands and branding — anything that creates a richer user experience. So for people throughout all types of industries — whether on the content side, the SEO side, the pay per click side, the social side — a robust, richer content drives better user engagement. SEOs have done experiments showing that more user engagement with the Google My Business page does seem to improve the rankings. So anything you can do on the branding side to make your business look better and make people more willing to engage with it has the potential benefit of improving your ranking. Having an owner-verified Google My Business listing correlated better with strong search performance. So if you’re a small business and there’s nothing you’re doing with Google My Business right now, get verified. 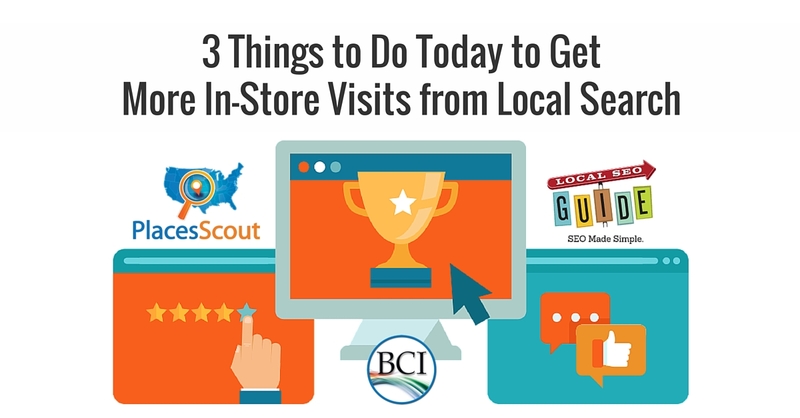 How do these top four local SEO to-dos line up with your experience? Shout out in the comments. Extremely amazing details. I will surely try this out and will let you know about my experiences.Always read your posts. Keep sharing. Great addition to the list, Confidence. Building relationships in your community is bascially what all these tips boil down to — whether reviews, links or UGC photos. Bloggers in your neighborhood? Another awesome example. great article.. Just felt the need to add. Another great way to optimize your local store for local search is to communicate and create a relationship with local bloggers.. Just like the meetup point earlier pointed out, building a strong or maybe weak relationship with local bloggers who feeds the locals with their contents is a sure bet to getting local clicks to your local store. I know this from experience working with a local E-commerce in my country.. you will never know the power of local bloggers until you network with them, especially those having huge presence on social media..
Anyways, Great article here virginia.. Thank you @Virginia Nussey for sharing this very informative article on Local SEO. I will definitely follow these link building methods for Local SEO. Much Appreciated! Great article Virginia – I think these absolutely make sense. I’ve done these things for my clients and I’ve seen results. One of the other things I’ve encouraged clients to participate in local social media spaces where prospective clients are hanging out and get engaged. This helps with building brand awareness and provides a channel for attracting customers. Great article on Local SEO. I totally agree that one of the factors for ranking is local reviews and photo’s. Put in the time and effort and your local listings will be rewarded. Keep up the articles, thanks for your help! Great Insight about Local SEO! Now a days it has become quite challenging to get link from high authority sites. This post will help to do so. Great Post for Local SEO, I am implement this techniques for my website. When you say “local search” are you referring to Google My Business? Or does the term encompass all geograpically specific organic search vehicles? Great LOCAL SEO content… Thanks for putting together the report Mark & Dan. Love your service Places Scout! as a side note (schwing) Virginia’s hot! Nice blog for local search and i will definitely follow these link building methods for Local SEO. Much Appreciated! I am glad I found your site. Getting links is a bit of a challenge. I probably need to make it a priority and figure out how to do it without appearing to be a link spammer. In any case, I read this blog and will be reading the rest of them. Thanks. For long i have looking for this one nice reveal about local SEO. Going to implement for! Thanks keep growing! Excellent blog. This article is so nice and very useful.Thank you so much for sharing.